Lesser Hemsworth* is a entry level peon working for Gary Oldman at a corporation that does something with phones. Lesser Hemsworth* wants to be more than a middle class schmuck/end up like his father, who was a security guard (Richard Dreyfuss, you don't need any more money). After giving a presentation to Oldman, Lesser's* idea is shot down when he gets testy, and he and his team are fired. 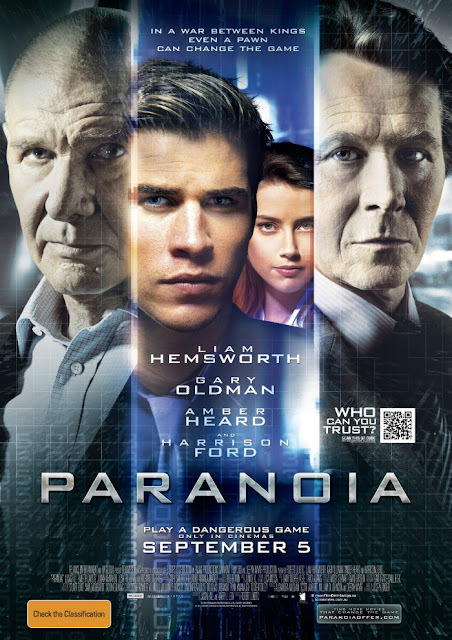 After a night of partying on the company's dime (LOL, like they wouldn't find out immediately), Lesser Hemsworth* is blackmailed by Oldman into committing corporate espionage in the span of about a week; his task is to infiltrate Harrison Ford's cell phone company (and biggest competitor to Oldman) and steal his groundbreaking cell phone prototype and idea thingy. * = not a typo. Why, why, WHY, why, WHY???? Gary Oldman, you were better than this. Harrison Ford, you were Han motherf**king Solo. Richard Dreyfuss, you conducted bands and chased down Jaws. WHAT ARE YOU GUYS DOING WITH LESSER HEMSWORTH????? 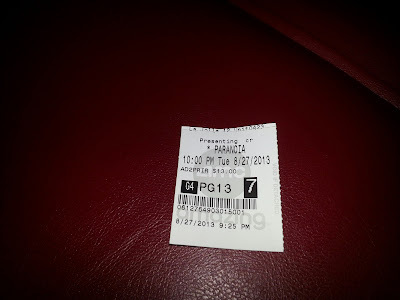 For a movie with so many big named stars, this is boring, trite, inconceivable in its time frame, poorly executed, poorly shot, poorly paced, poorly written, and that's being nice. The only people ever worth watching in this film are Oldman and Ford, and they each garner one complete point towards our ratings. If they are not present in the scene (which is OVER HALF OF THE FILM), it's virtually unwatchable. The plot is ridiculous. We both fought back the sudden urge to shut our eyes and drift into la-la land, free of Lesser Hemsworth. Amber Heard adds nothing to the film except fake tears, idiocy, and phony sashaying. Liam Hemsworth is not a good actor, period. Sure, he and she are both pretty people, but pretty does not equal the ability to act. In fact, if they were trapped in a paper bag, they wouldn't be able to act their way out of it. Someone on IMDB said that, for a 2% rating on Rotten Tomatoes, this movie better be "Plan 9 From Outer Space" bad. The difference here is that while "Plan 9 From Outer Space" can now be looked upon with cinematic integreity as a horrible but hilarious throwback, "Paranoia" will never, EVER be spoken of highly. Ever. Not now, not in 20 years, not ever. No one will remember this movie. It will be a twinkle in Liam Hemsworth's eye when he's forced back down under after Miley Cyrus has twerked herself into an early grave. If you had any inkling to see this movie based on it including Gary Oldman or Harrison Ford, don't. Save yourself 2 hours and watch them be rivals in "Air Force One." You can thank us later.